The live version of this webinar took place on Sep 13, 2017. It was excellent. Given that a month's subscription to PeakProsperity.com is only $30, you may want to give serious consideration to enrolling instead. It's only $5 more, and gives you access to the webinar PLUS all of the premium analysis, webinars, reports, podcasts, alerts and events that PeakProsperity.com has to offer. That's a pretty screaming value for an additional five bucks. The Most Overvalued Market Of All-Time? By an increasing number of metrics, today's financial markets are more overvalued than we've ever seen before. The price-to-sales ratio for the S&P 500 has never been this high. The same is true for its price-to-earning-growth ratio. Interest rates have never been this low -- in 5,000 years of human history! As a result, nearly all major financial assets, as well as housing, are trading at all-time highs, well above the levels seen before the 2008 financial crisis. All this is happening while the fundamentals underlying our economy stagger along anemically (at best) or, in many cases, exhibit accelerating deterioration. Which begs the questions: How much longer can this last? What will the triggers of the inevitable correction be? What indicators should we be watching most closely? How bad will things get when reality intervenes? Which is why, via our new webinar platform, we're giving you insider access to two of our favorite world-renowned market experts, who regularly produce some of the most valuable -- and actionable -- analysis and commentary on the financial markets, the global economy, and the future actions of the central banking system. During this webinar, you'll hear their latest intelligence and forecasts AND be able to ask each speaker questions directly. This will be an amazingly rich and interactive experience. Likeliest Failure Points -- Where will a market breakdown most likely occur first? Key Crash Indicators -- What data should we watch most closely? Damage Prediction -- How bad will "bad" be during the next market correction? How will different asset classes be affected? How to protect our wealth -- What positioning may offer effective protection from today's markets? Upside Strategies -- Which investment strategies are likely to benefit from a coming correction? A Return To Sanity -- What changes/reforms would be most beneficial in reducing market risk going forward? Normally, registration for an event with speakers like these would cost hundreds of dollars, if not more. Of course, you'd also need to add to that your travel costs of getting to the event. But through our new webinar platform, we're able to offer this to you for just $25. The event itself will take place on Wednesday, September 13 at noon EST/9am PST. It will last approximately an hour and a half. The price to participate in this webinar is $25, unless you are an enrolled member of PeakProsperity.com (i.e. paying subscriber with access to our 'Insider' content). In that case, it's FREE. To register for this Insider webinar, click the big blue button below -- though given that a month's subscription to PeakProsperity.com is only $30, you may want to give serious consideration to enrolling instead. It's only $5 more, and gives you access to the webinar PLUS all of the premium analysis, reports, podcasts, alerts and events that PeakProsperity.com has to offer. That's a pretty screaming value for an additional five bucks. As with our previous webinar, the discussion with our featured experts will be moderated by PeakProsperity.com co-founder Chris Martenson. Grant Williams - Grant is portfolio and strategy advisor to Vulpes Investment Management in Singapore and also one of the founders of Real Vision Television — an online, on-demand finance channel showcasing the brightest minds in finance. His newsletter, Things That Make You Go Hmmm..., has grown to become one of the most popular and widely-read financial publications in the world. Lance Roberts - Lance is the Chief Strategist/Economist for Clarity Financial, Chief Editor of the Real Investment Report and author of the Real Investment Daily blog. Lance is particularly famous for the excellent charts he publishes on a weekly basis. We have invested in this new webinar platform in order to enable us to produce more of these 'gathering of great thinkers' for you in the future. We have great hopes for this new webinar platform, but how much we use it in the future will be a direct function of how many people like and attend these live events. So if you want more of these, please participate! If you haven't yet participated in a Peak Prosperity webinar, here's what you can expect. Our recent The End Of Money webinar brought together -- David Stockman, Axel Merk, and G. Edward Griffin -- several of the world's top experts on the central banking system, world currencies and financial markets. Moderated by Chris, each speaker shared his latest thoughts on our current economic situation (spoiler alert: they're each very worried), as well as his predictions on what the central banks are most likely to do next -- and what the implications will be. G. Edward Griffin delivered a sober warning, urging us not to underestimate how ruthless the central banks are in sacrificing the public good in order to advance their own agenda. Chris then presented on his own forecast, followed by an active discussion with New Harbor Financial (Peak Prosperity's endorsed financial advisor) as to strategies for preserving one's financial wealth during today's uncertain times. "I am inspired and in awe how the speakers effectively take massive macro subject areas and break them down and put into context so those of us not as plugged into the topic can understand"
"Great info. Looking forward to the next one. " "Chris Martenson is one of the best communicators in the modern world of finance. As a moderator he can quickly drill down to the most pressing questions people have with often the smartest minds in the business." "Loved the advice at the end." "The ability to ask questions to some of the most brilliant minds regarding such topics was worth the price of admission alone! " 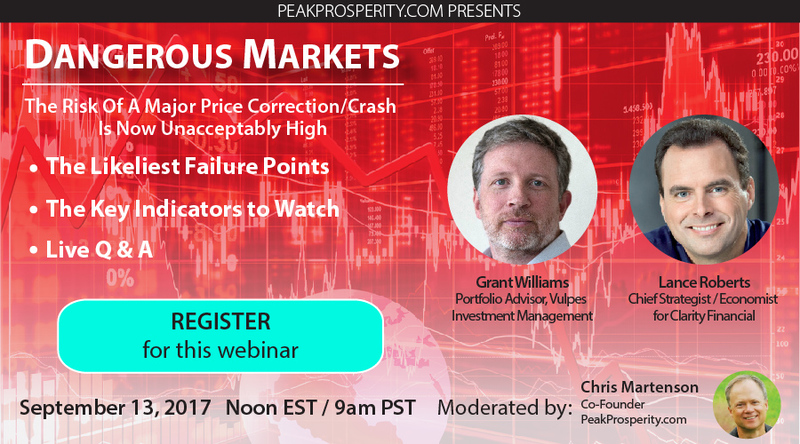 We expect this next "Dangerous Markets" webinar to be just as value-rich, if not even more so, for participants. I will not be available to watch the program at that time. Can I view it at a later time? Yes, Larry. A link to a replay video of the webinar will be sent out after the event to all who registered.